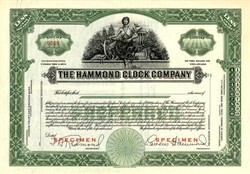 Beautiful engraved RARE specimen certificate from the Hammond Clock Company printed in 1928. This historic document was printed by Northern Bank Note Company and has an ornate border around it with a vignette of an allegorical woman. This item has the printed signatures of the Company's President, Laurens Hammond and Secretary and is over 79 years old. As the inventor of the Hammond organ, Laurens Hammond stands as one of the great contributors to the electronic music industry. His route to the invention of the Hammond organ was a long and twisted one, however. After receiving much of his early education in Europe, where his family moved in 1898, Hammond graduated from Cornell University in 1916 with a degree in mechanical engineering. Upon graduation he took work with the McCord Radiator Company in Detroit, Michigan, but his career was interrupted by World War I. After serving in the U.S army in France, Laurens invented a tick-less clock by encasing the motor in a sound-proof box. Enamored with inventing, Hammond, who had been working as an engineer for a Detroit automobile company, left his job and moved to New York City to devote his energies full-time to the tick-less clock and other inventions. During this phase of his career Hammond made another important invention, a synchronous motor designed to revolve in phase with a 60-cycle electric alternating current, which was becoming standard at the time. By placing this motor within his tick-less clock, Hammond was able to invent a soundless electric clock in 1928. 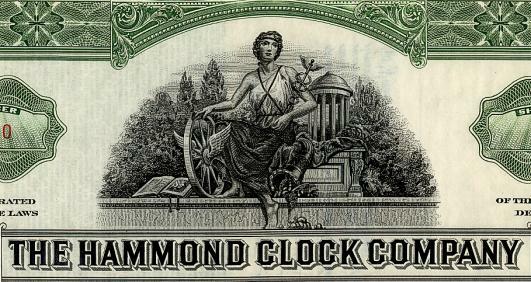 This lead to the founding of the Hammond Clock Company the same year. Initially, business was booming for Hammond, but the Great Depression soon changed that. Searching for new uses for his synchronous motor, Hammond hit upon the electric organ as a potentially suitable instrument for his motor, and testing of the first prototype of the Hammond organ began in 1933. He won patent approval soon after, on 24 April 1934. The first order for the Hammond Organ came almost immediately from engineers working for Henry Ford, who had been charged with the task of looking into the manufacture of electric organs for the famous industrialist. On 7 February 1934, Ford purchased six organs. Hammond changed the name of his company to the Hammond Instrument Company in 1937 to reflect the importance of this new invention. Hammond later developed the less expensive chord organ in 1950, designed for people who had never used a keyboard before, opening up a vast market. In 1953, the Hammond Instrument Company became the Hammond Organ Company, further demonstrating the predominance of the sales of Hammond�s organs rather than the electric clock he invented earlier. After retiring in 1960, Hammond spent the remainder of his life in his many homes, both in the United States and abroad. Laurens Hammond (January 11, 1895�July 3, 1973), was an engineer and inventor of the Hammond organ.